GAINESVILL, FL- Florida faced off with the Georgia Bulldogs in a key SEC showdown on Saturday. The Gators found themselves down by eight points in the second half, but made a run to tie the game and force overtime. Kasey Hill hit two of four free throws in the waning seconds of the second half. Canyon Barry and John Egbunu played a key part of the overtime, as Barry made both free throws he attempted in the extra period, and Egbunu found several rebounds, and made a shot to put the Gators up by multiple scores. Barry had his best game as a Gator scoring a season high 27 points and grabbing 7 rebounds. Barry made two rare four-point plays and shot 7-13 from the field. Barry also went 8-8 from the free throw line. Freshman Keith Stone also played a key role for Florida as he scored 17 points while making three of his four three-point shots. 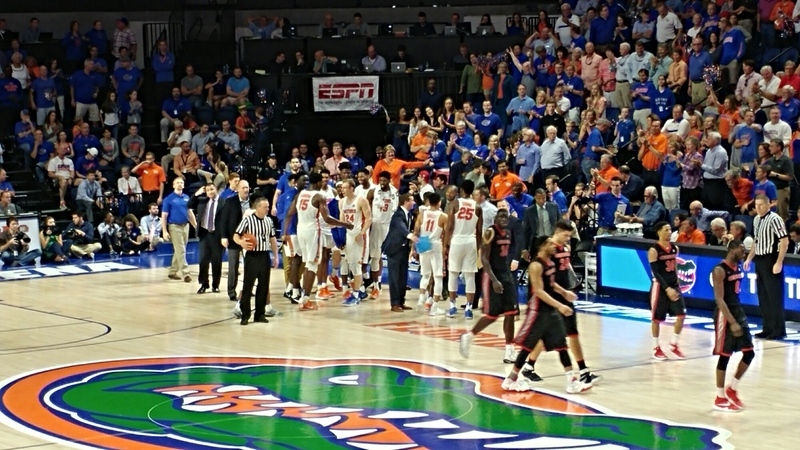 Florida’s bench outscored their starters for the second consecutive game led by Barry and Stone, and the Gators bench outscored Georgia’s bench 51-5. Florida is now 5-0 during conference play, and will play a tough road game against South Carolina on Wednesday before returning home to play Vanderbilt next Saturday. Should Amanda Butler be on the hot seat at UF?